The last the stationary movements are: Big Bear Stretches巨熊伸腰, Roc Extends its Wings大鵬展翅 and Supporting the Sky托天雙舉 and These are the most interesting movements. The last six movements are still working on the shoulders, spine and waist, but most important is the relaxation. These movements are more vigorous than the others and so create more Qi. Though we are moving our arms and legs, we are in fact moving our internal organs and this is true from the start with Holding the Dantian手抱丹田 all the way to Supporting the Sky. 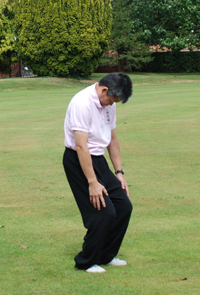 This is the purpose of doing these movements, to move our bodies internally which stimulates the Qi. Then we can call these movements Qigong. Each movement has a different purpose and is for a different part of the body. This is what makes us healthy. Balancing Gong is the first step we take in learning Qigong. If we can get these movements right, then we can get the other movements right, though it might take some time we will get better and better. All the major diseases are internal problems, if we can make sure our internal organs are healthy, and then we will be healthy.